A few months back I was getting my hair cut and I was chatting with hairdresser about my book blog and when I went to pay some how it was mentioned to the lady at the desk. She told me she had a friend that had recently published a book. I like to support local authors when I can so I gave her my card. Derek contacted me shortly there after. He described his book as Swordpunk. I had never heard of Swordpunk, but I have been curious about the 'punk' genre. So I told him to send it my way. From the cover, you might think it is a kids book. It is not. Though I think the main characters may be in their teens. But it is set during midevil-ish times, so teens were practically grown ups at that time. 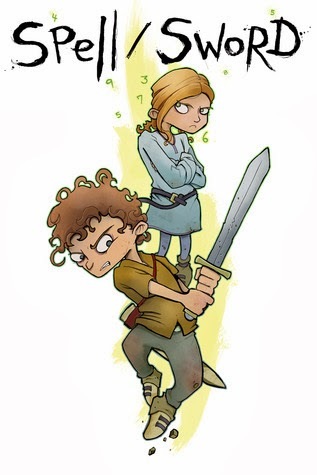 Spell/Sword is a fantasy novel that features Rime, who is a a wild mage, and Jonas, who is a squire/soldier. The background of these two is a bit shady, but clues are dropped throughout the story. Rime is on a trek and is in need of a body guard. Jonas is a prisoner on a work detail when he is "recruited" for the job. Sorry that the description is a little vague. I'm not exactly sure where the story was going. In a lot of ways Spell/Sword reminded me of Steven George and the Dragon (my review). It went from one adventure to another. I have really mixed feelings about the book. One, it is definitely not a genre I would pick up for myself. I'm not big on fantasy. If it hadn't been a local author I probably wouldn't have picked up the book from the description. But in some odd way I liked the story. At times the fantasy was light and it was just your typical adventure story. Other times, it was full on fantasy. Totally lost me with the frogmen. Two, the story meandered too much. Like I said it kind of went from one adventure to the next. I wasn't really sure what the story was about. Was it just a collection of adventures or is there really a plot? ran through my head more than once. And while the story mostly stayed with Rime and Jonas, it jumped to other characters - a devil-kin, a witch, and the white knight. It was just glimpses and felt kind of abrupt. I know he needed to introduce these characters who pursue Rime, but it interrupted the flow of the story. Yet, at the same time I liked the storytelling (this is probably how it is most like Steven George and the Dragon). It just left me feeling off kilter some how. Three, there seemed to be some gratuitous gore. In college, I dissected a cat and then went to eat lunch. I grew up on a farm and worked at a zoo scooping poop. I tell you this so you know I'm not overly squeamish. However, the descriptions were a bit over the top. It just didn't feel like so many adjectives needed to be used. Given all that, I did like the character of Jonas. I wasn't really sure how to take him in the beginning because we have so little backstory of his. Yet, he grew on me. Rime grew on me as well. She seemed pretty self-centered in the beginning, but towards the end there were glimpses that she might not really be that way. Once the story became more streamlined, and had a more definite plot, I really got into it. And then it ended. While there is a conclusion, it is evident there will be a sequel. Yet, the ending wasn't really satisfying. I understand the need to stop and it felt natural for the story to end where it did (otherwise it would have been too long). However, I think the story could have been tightened up at the beginning to allow for the story to be furthered at the end. I'm curious enough (and care enough about Jonas and Rime) to want to read the sequel. I wonder if I enjoyed fantasy novels more if I would have liked it more. I definitely think if you are into the punk genres and fantasy stories, then you should give Spell/Sword a try. Girl Who Reads is an Amazon advertising affiliate; a small fee is earned when purchases are made at Amazon through the link above. A free ebook was provided by the author.